Health and beauty retail has been undergoing a number of changes in recent times and will continue to do so. Many beauty bloggers and key opinion leaders (KOLs) were invited to the launch ceremony of the first flagship store of Watsons, the leading health and beauty brand in Asia and Eastern Europe, held at Bitexco Financial Tower in Ho Chi Minh City in mid-January. With its arrival, the landscape of Vietnam’s modern health and beauty retail scene promises to become more vibrant. As retailers in the sector continue to expand their footprint in the market and invest in improving their stores to attract shoppers, the outlook for the channel is set to further accelerate. Following in Guardian’s footsteps, she said, Watson is expected to differentiate itself by offering a wide range of beauty and healthcare products in its stores, some of which could be the first in Vietnam. Private label products will also be a focus, in order to create a loyal base of customers. It intends to bring its full expertise to Vietnam in order to create a unique and exciting shopping experience through its online and offline platform, said Mr. Rod Routley, Regional Managing Director in Asia of the A.S. Watson Group. “As the flagship brand under the A.S. Watson Group, we are backed by a global supply network that enables us to offer exciting new products from internationally-renowned brands, while our own quality brand and exclusive products will also be available to Vietnamese consumers to provide a choice of products to increasingly savvy customers in the country,” he said. Watsons’ innovative concept store covers approximately 239 sq m on the ground floor of Bitexco Tower, and it hopes to create a modern health and beauty shopping experience. Showcasing a wide range of skincare and make-up brands, the store will have over 6,000 products on offer, complemented by its online store featuring 8,000 products. The group currently operates over 7,200 stores across Asia and Europe, and Vietnam is its 13th market. It plans to open at least 50 outlets around Vietnam over the next five years and this latest foray reflects the competitive landscape of the country’s health and beauty market, where modern retail chains such as Medicare and Guardian have already secured strong footholds. In Vietnam since 2001, Medicare was the first beauty, health, and well-being retailer in the country. It’s currently operating 85 stores and expanding rapidly nationwide. It has a wide range of exclusive brands, and continuously updates offerings that customers have never seen in Vietnam before, according to Mr. Bart Verheyen, Commercial Director at Medicare Vietnam. Meanwhile, Guardian is a well-known retail chain operating under the Dairy Farm Group, a leading pan-Asian retailer. It has opened more than 74 stores in Hanoi and Ho Chi Minh City and the southern provinces of Dong Nai and Vung Tau since its arrival in 2011. “Growing disposable incomes and Vietnamese people’s preference for foreign brands have been drivers of the penetration and expansion of foreign retailers in the sector,” Mr. Østergård went on. Vietnam’s health and beauty market is indeed lucrative. Double-digit growth of 11.5 per cent was recorded in 2017 and is thought to have expanded significantly in 2018, marking five years of continuous growth, according to global market researcher Euromonitor. Mr. Østergård further noted that specialists are optimistic. 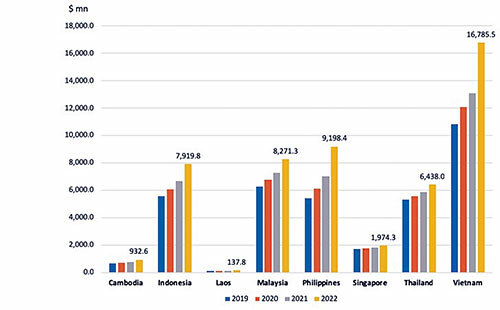 For example, the Australian Trade Commission (Austrade), has forecast that Vietnam will post the second-highest growth in Southeast Asia in the sector to 2021. 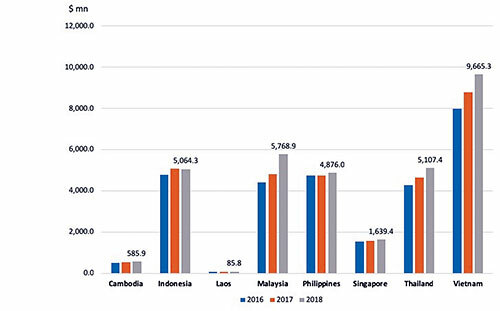 Vietnam definitely has major potential due to its large young and vibrant population and rising middle-income group, according to Mr. CP Saw, Director and Head of the Beauty Portfolio ASEAN at Informa/UBM. Awareness is important in grooming and personal image has boosted demand for health and personal care products. This is a trend that started many years ago in neighboring countries like Malaysia, Indonesia, and Thailand. Consumers like new and fresh concepts that provide a one-stop solution for their personal care. More international retailers are expected to open new stores in Vietnam. Agreeing, Mr. Routley from Watsons said Vietnamese consumers are well-informed about beauty trends, are technologically-savvy, and, especially, are welcoming of new trends. “We see our Watsons Beauty and Wellness concept being well suited to consumers that want an exciting way to experience and purchase a wide range of skincare, cosmetics, derma skin, and personal care products,” he said. Moreover, Ms. Van forecast that key sectors looking to grow strongly over the next few years include vitamins and dietary supplements, optical goods, and internet retailing of health and beauty products. According to Mr. Routley, Vietnam has a reputation as being highly-connected and trend-aware. Watsons will therefore roll out an e-commerce platform combined with advanced technology to bring a personalized and attractive offering to increasingly-modern Vietnam consumers. The physical and online stores will ensure consumers can enjoy 24/7 access to a wide range of products anywhere through its website, mobile app, or stores. “With a long-term vision for the market, we will invest in stores, online, and digital communication in order to form close relationships with Vietnamese customers,” he said, noting that the online and offline channels will complement each other. Beauty and personal care products are particularly ripe for online development, given consumers’ combined interest in both exploring new products and replenishing the ones they already own and love, Ms. Trang said. These two shopper modes – discovery and replenishment – are some of the strongest drivers of online penetration in fast-moving consumer goods (FMCG). They encourage consumers to visit and shop online by providing product diversity as well as convenience in ordering and payments. Consumers can order easily on their website or mobile app, then take advantage of the delivery service or collect their goods from the store. Nevertheless, it is going to be a tough game for foreign retailers in Vietnam, according to Mr. Østergård. While location is key, high rentals are one of the major challenges for foreign retailers in expanding. Another barrier they have been facing in Vietnam is the dominance of local stores and supermarkets, which remain a popular stop for healthcare and beauty product shopping. However, professional customer care is a competitive advantage foreign retailers can capitalize on to build a life-long relationship with Vietnamese customers. Meanwhile, Mr. Saw believes a major challenge for retailers is acquiring customer trust and loyalty, and beauty and health trends are changing very quickly. Retailers need to constantly update product variety, stay in touch with loyal customers, and know their shopping behavior. The should hold activities and events for customers and constantly provide them with a new shopping experience.